The output level is about 10Vpp (please refer to the note at the bottom for the output level of older versions). The document A110_4_trimming_potentiometers.pdf explains the functions of the trimming potentiometers. The document is planned only for experienced users ! Please do not change the settings of the trimming potentiometers unless you are sure that you want to change certain settings. Modules which are returned with (mis-)adjusted trimming potentiometers cannot be treated as case of warranty ! Socket 1V/Oct is normalled to the internal control voltage coming from the bus (interruptible by removing the jumper JP3). Plugging a patch cable into the socket 1V/Oct does interrupt the internal bus CV connection ! Other VCO modules may behave different in this regard (e.g. adding the internal bus CV to the CV applied to the socket at the front panel). The control voltage applied to the socket 1V/Oct is added to the control voltage coming from the bus (interruptible by removing the jumper JP3). Connecting a cable to the socket 1V/Oct does not interrupt the bus CV connection ! 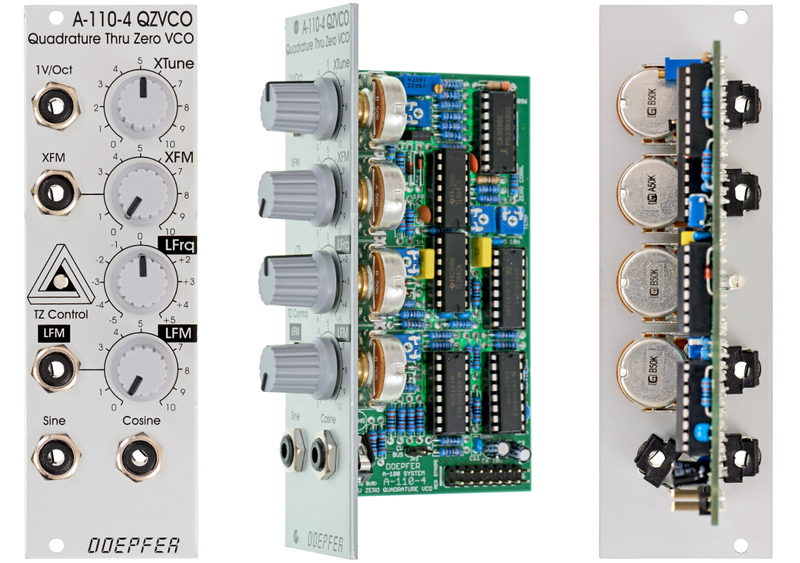 It is also possible to convert the A-110-4 into a Thru Zero Quadrature VCLFO by adding two capacitors to the frequency determining capacitors (C1 and C2). For details please refer to the document A110_4_trimming_potentiometers.pdf. Additional note regarding linear FM: The LFM CV input is DC coupled. If the input is used for linear FM in audio range and the signal applied to this input has a DC offset it will cause a small pitch shift that depends upon the value of the DC voltage. Especially when a VCA is used to change dynamically the level of the modulation signal this may generate a pitch shift caused by the control voltage feedthrough of the VCA. The control voltage feedthrough adds a DC voltage at the output which depends upon the control voltage of the VCA. For this application VCAs with a very low CV feedthough should be used or the signal output of the VCA should be AC coupled to the LFM input of the A-110-4 (e.g. by inserting a capacitor). Note: The first version of the A-110-4 manufactured until about October 2015 had a lower outout level (about 3Vss). All modules manufactured later than October 2015 are equipped with internal amplifiers that increase the output level to about 10Vss. All A-1104SE (i.e. with blue front panels and white knobs) are already equipped with the amplifiers. For the standard version with grey front panel it depends upon the production date if the output level is ~10Vss (manufactured later than October 2015) or ~ 3Vss (manufactured until October 2015). A small test label at the rear side of the front panel or at the pc board tells the manufacturing date (MMYY with MM = month and YY = year of production). The new version with the amplifiers can be identified also by an additional circuit TL082 at the bottom of the pcb behind the cosine socket. The picture of the above link still shows the old version (without TL082). We offer an amplifier kit that can be used to increase the output level for the first version of the A-110-4. A bit of soldering is required to install the kit. Details in the user manual of the amplifier kit. The circuitry of the module is based on a design idea by Henry Walmsley published in December 2003 in the EDN magazine. The basic design idea has been comprehensively modified, improved and expanded by several features (e.g. a temperature controlled linear and exponential current source, control voltage full wave rectifier/comparator/switches for thru-zero FM, thru-zero current fine adjustment). Even on a one channel oscilloscope both signals look the same ! One needs a two-channel scope to see the phase shift !